Gabrielle Davis has a big heart and big plans for her future, and she never thought about taking her ambitions anywhere other than Southern Arkansas University. Davis, 18, of Magnolia, was recently selected among a statewide pool of applicants as the 2014 recipient of the Pringle Scholarship through the Arkansas Community Foundation. She earned this award because of her dedication to community and her work with the Columbia County Youth Advisory Council (YAC). Wise beyond her years, Davis has a clear vision for how she plans to dedicate her life to the community. 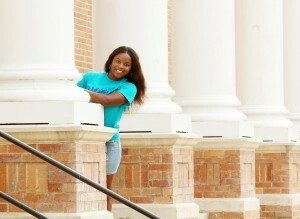 Her academic journey has already started this summer at SAU, a place she said feels like home. She is majoring in political science to put her on track to become a social attorney with an emphasis in child advocacy. Outside of class, she hopes to become a part of SAU’s community involvement efforts. She has earned a spot in the SAU Honors College and a scholarship position with the SAU Choral Ensemble. But her scholarship funds do not end there. Being a first-generation college student, Davis has sought out all the college funding sources she could find. She has also been awarded an SAU Blue and Gold Scholarship, a scholarship from the Boys & Girls Club, and the Arkansas Challenge. She has been a standout at everything she has touched in her short life. Academically, she completed Magnolia High School with a 4.18 GPA. In addition to her involvement with the YAC program, she participated in choir, drama, softball, drill team, Fellowship of Christian Athletes (FCA), and Pride. She was elected Student Council president and was a member of Mu Alpha Theta and the National Honor Society. She is an alumnus of SAU’s Upward Bound program, and is a student in SAU Upward Bound Bridge this summer. She is the daughter of Kenneth Davis and Rebekah McDowell. Her sister, Gabrianna McDowell, is a junior pre-nursing major at SAU.